The Quietus | Opinion | Black Sky Thinking | Still Glad To Be Gay: Does Pride Need To Return To Radicalism? In case you hadn’t noticed, Pride season is upon us again. An excuse, as if one were needed, for members of the LGBT+ community to don their finery and shake their collective booties for all they are worth. Although we’re celebrating the fiftieth anniversary of the decriminalisation of homosexuality in the UK this year, the backlash following Pride in London’s recent and ill-advised poster campaign (sample slogan ‘Being homophobic is sooo gay!’), shows that there’s still a split between LGBT+ people who want to party and those who feel the need to protest. It’s great that Pride has been embraced by the mainstream, but has the original message been lost? Pride grew out of civil unrest. In the US violent protests had taken place at all-night coffee shop Cooper’s Donuts in Los Angeles in 1959, and at Gene Compton’s Cafeteria in San Francisco in 1966; when the NYPD entered the Stonewall Inn on Christopher Street, Greenwich Village’s LGBT+ community fought back, and the demonstrations that erupted are now enshrined in history as the most significant event in the struggle for LGBT+ rights in the United States. Pride and politics were inextricable. Reacting to a high-profile campaign led by singer Anita Bryant to deny LGBT+ people equal rights, tens of thousands of people marched in cities across the United States. In San Francisco more than 100,000 protested; a Pride parade along New York’s Fifth Avenue attracted at least 25,000, and there were demonstrations in Los Angeles, Seattle and Denver. Protests were held in London, and in Amsterdam 2,000 people marched through the city carrying banners that read ‘Against the American witch-hunt on homosexuals’. Then, in February 1978, a song about the real-life experiences of LGBT+ people made the UK Top 20 and Pride gained its anthem. ‘Glad To Be Gay’ by the Tom Robinson Band was my coming out song. The angry, venomous solo performance Robinson gave at Amnesty International’s Secret Policeman’s Ball fundraiser in June 1979 sparked the beginning of my gay life. I was 14 and I had already attempted in my own clumsy way to come out, and when the music from the show was issued the following year I pulled my pocket money together and bought a copy. ‘Glad To Be Gay’ changed my life; I’m sure it changed many other lives too. ‘Glad To Be Gay’ was inspired by an increasingly violent series of police raids on gay pubs in London. In 1975 three coach loads of police officers made a midnight raid on Rod’s Club in Kings Road, Chelsea; the following night a similar number of police raided Earl’s Court pub The Boltons. Other LGBT+ drinking haunts were singled out, and agent provocateurs were used to entrap gay men in popular cruising areas. Robinson himself was caught up in a raid on the Coleherne Arms in Old Brompton Road. ‘By the summer of ‘76 the police in London were completely out of hand,’ Tom explains. ‘They were using the Sus Laws - you could arrest anybody on suspicion of anything - and so black people in Notting Hill Gate and Brixton were being arrested for being black and in charge of a motor vehicle, stuff like that. They were able to swan in and make easy arrests because they figured that gay men in that climate and at that time were very unlikely to contest an arrest in court. It was clear that the police were our enemy, and they were a common enemy for other oppressed minorities at the time too.’ This was Britain’s Stonewall moment, and the continued abuse of the Sus Laws against the black community would lead to the early 80s race riots in cities including Bristol, Liverpool, Birmingham and Leeds. As if dealing with the police wasn’t enough, in January 1978 20 fascist thugs from the National Front smashed up the Royal Vauxhall Tavern, one of London’s longest-established gay pubs. Similar attacks would inspire LGBT+ people to join the Anti Nazi League, established in 1977 to oppose the rise of the far right. Pride became an opportunity for the community to show solidarity with other minorities, to demonstrate that we were not going to be oppressed. Yet the arrests continued: during the Pride march in London in 1980 ten men were charged with misdemeanours including obstruction and minor assault, and one with possessing an offensive weapon - a prop meat cleaver worn as part of his headdress. But police oppression and attacks from right wing hate groups were not the only issues facing the LGBT community. Britons were starting to become aware of a new disease that was decimating the gay community in the United States; AIDS education quickly became the number one priority within the international LGBT+ community. Pride gave us the opportunity to speak out against ignorance, prejudice and a world that seemed not to care if our people were dying in their thousands. Pride was essential in giving young people a space to be themselves, and the support of musicians happy to wear their political colours on their sleeves was important for young LGBT+ people in Thatcher’s Britain. The members of Bronski Beat were openly gay, insisted that their music would reflect this and used their clout to support minorities, miners (as immortalised in the hit movie Pride) and the socialist movement. 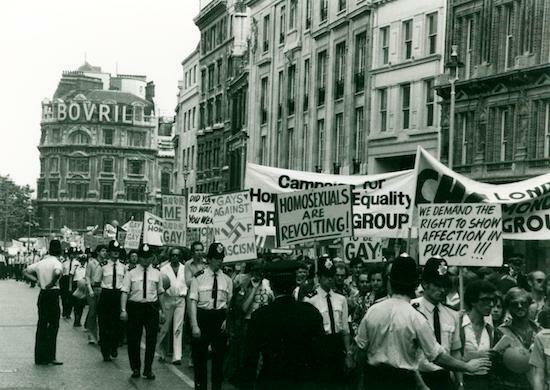 In return for the LGBT+ community’s support trade unions marched alongside us at Pride in London in 1985, and at the Labour Party Conference a motion to support equal rights for gay men and lesbians was carried thanks to the votes cast by the National Union of Mineworkers and their allies. On leaving Bronski Beat Somerville formed The Communards with Richard Coles, and the pair joined Tom Robinson, Billy Bragg, Paul Weller and others in the socialist musicians collective Red Wedge. In 2017, in countries including Turkey and Russia, even attempting to organise a Pride event can land you in jail... then there are countries where simply being LGBT+ can be a death sentence. With the number of LGBT+ young people attempting (or, sadly, succeeding) suicide on the rise (LGBT+ teens and young adults have one of the highest rates of attempted suicide worldwide) perhaps its time to put the politics back in to Pride. Gay filmmaker and former councillor Christian Martin certainly thinks so. ‘I am all for celebrating but sadly I feel that the politics has been lost. Equal rights have advanced, but when a British Government fails to raise international voices of concern over Chechnya or tackle the DUP’s vetoing of equal marriage in Northern Ireland then something is wrong,’ he says. ‘We are still falling short on equalities here and abroad.’ Clearly neither the fight nor the party are over yet.